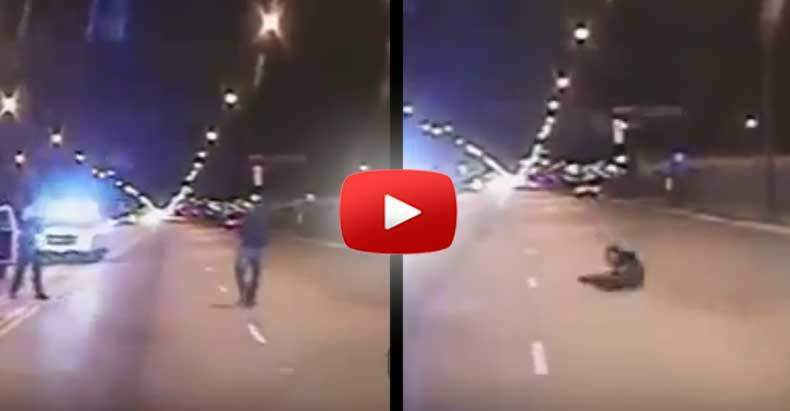 On the same day that Chicago police officer Jason van Dyke was charged with first-degree murder, the city released shocking dashcam video which shows the bloodthirsty cop ruthlessly gun down 17-year-old Laquan McDonald. The police union claimed that McDonald lunged at the officers with a knife, but the video clearly demonstrates this to be a lie. In the video, a patrol car races toward the location where alleged car break-ins were occurring. A police SUV can be seen speeding to get in front of McDonald, who was walking down the street. Van Dyke and his partner exit the vehicle and almost immediately van Dyke begins firing. McDonald made no move toward the cops. Van Dyke shot the teen 16 times, with nine bullets striking him in the back. He kept firing even after McDonald fell to the ground, twitching as he took his last breaths. Van Dyke started reloading his pistol until another officer told him to hold his fire. Van Dyke was on scene for no more than 30 seconds, and opened fire on McDonald only six seconds after exiting his patrol car. The teen posed no threat to the cops, and was walking away from van Dyke when he was gunned down. Cook County State’s Attorney Anita Alvarez had already made her decision weeks ago to charge van Dyke, but held off federal authorities completed their investigation. “To watch a 17-year-old young man die in such a violent manner is deeply disturbing. The officer’s actions were not justified and were not a proper use of deadly force,” said Alvarez. This is the first time in nearly 35 years a Chicago cop has been charged with first-degree murder. If convicted, van Dyke will serve a minimum of 20 years in prison. The family of Laquan McDonald has asked that protests remain peaceful, as violence would undermine the progress toward police accountability.